The Historical Treasure is the largest permanent exhibition of the National Museum of History in Bucharest. 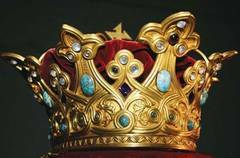 Here there are more than 3,000 pieces of precious metals and stones, valuables, belonging to several civilizations that have existed over time on the Romanian territory, from prehistoric times to the present. More treasures are part of the exhibition. The Treasure from Moigrad - consisting of pieces of gold, from the Neolithic, one of the oldest treasures of the world, with a history of 6000 years. The Treasure from Perşinari - dating back to the Middle Bronze Age and consists of a short sword and five axes. The Treasure from Cucuteni - consisting of a helmet, two bracelets and more applies for harness, dating from the V-th century B.C. 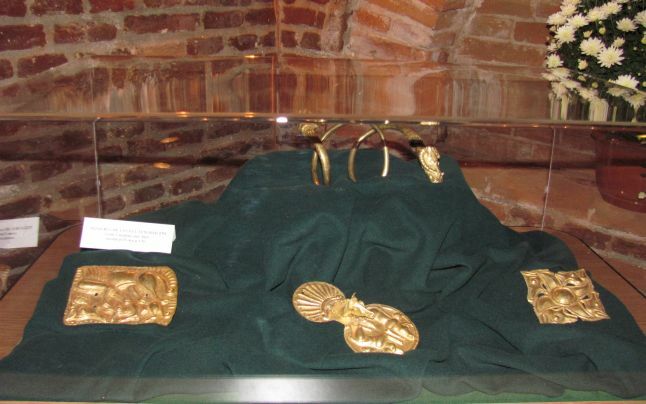 The Treasure from Hinova - consisting mostly of jewelry such as bracelets, necklaces but also fragments of gold ingots. Alongside these pieces is a bronze bracelet with overlapping ends, dating from the end of the millennium II B.C. The Treasure from Pietroasa (known as popular "The Hen with Gold Chicks") - initially composed of 22 pieces, were recovered only 12 in total weight of about 19 kg. Of these only five are made of gold, and seven are adorned with precious stones. The dating started in year 360 and continues until the first half of sec.V. 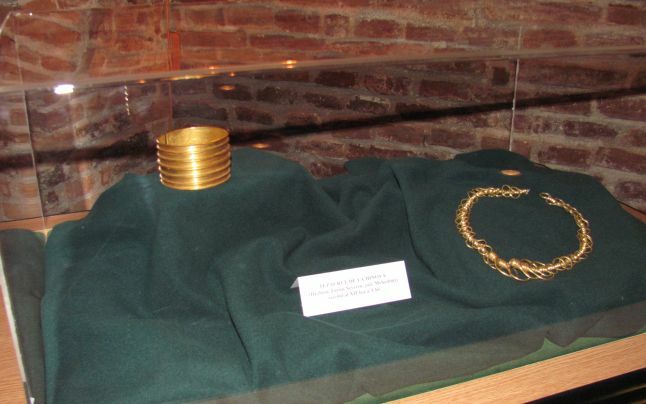 The Dacian bracelets of gold discovered at Sarmizegetusa belonging the Geto-Dacian era classic (century II B.C. - century I A.C.). The bracelets were modeled cold, by mallet from a gold ingot with a rectangular forme, and the decorations were executed by perforation and engraving. To all these are added other objects and jewels of the Ruler Alexandru Ioan Cuza and the Royal House of Romania (the crown of Kings Carol I and Ferdinand I, the crowns of the Queens Elizabeth and Mary, the scepter of King Ferdinand I and the mace of the King Carol II, the jewels boxes of the Queen Mary - the silver one and the gold one with precious stones, where was filed in 1938, the embalmed heart of the Queen) and the linings of jewelry dating from the period 1800-1940. Visiting The Historical Treasure you will be dominated by a profound experience pertaining to the past history of mankind, but also by a visual experience uplifting, under the auspices of the mysterious, mystical and metaphysical.